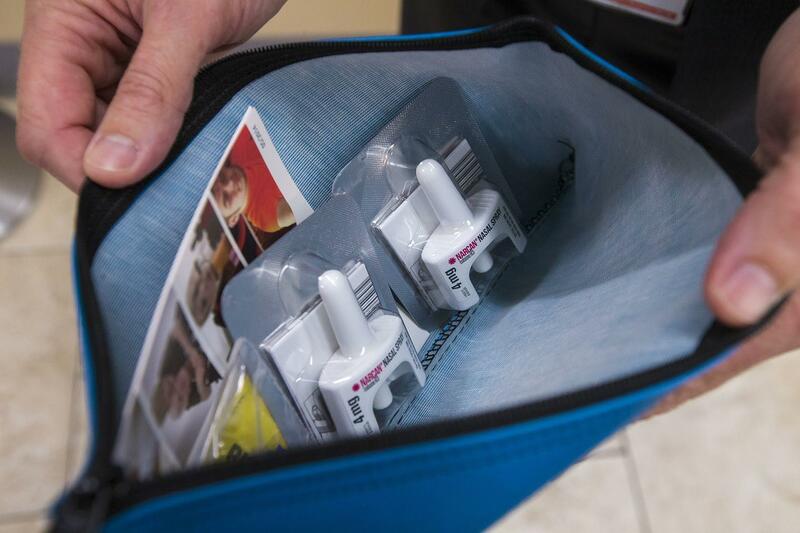 The contents of the naloxone kit inside an AED box located in the VA West Roxbury cafeteria. 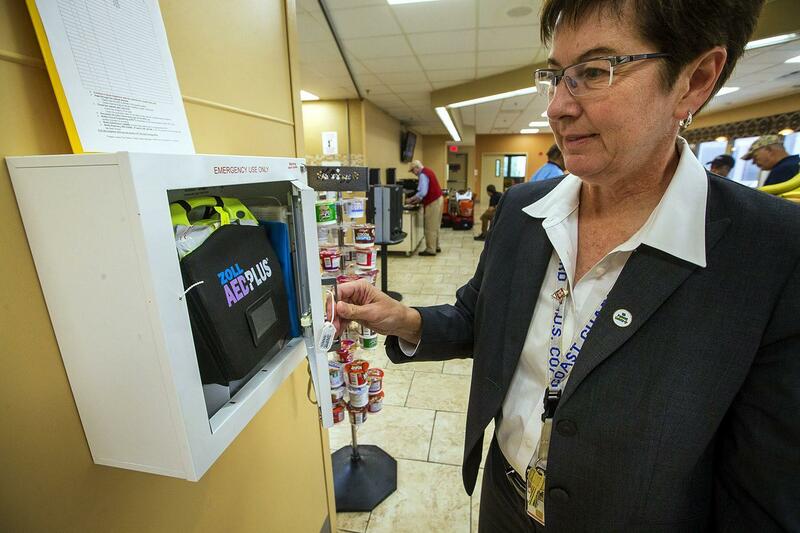 Pamela Bellino opens the AED box located in the cafeteria at West Roxbury campus of the VA Boston Healthcare System. The blue pouch, tucked next to the defibrillator, contains the naloxone. The paramedics immediately administered naloxone, often known by its brand name Narcan, to reverse the man's opioid overdose. But brain damage can begin after just a few minutes without oxygen. Pam Bellino, patient safety manager for the Boston VA, read that incident report back in December 2015 with alarm. "That was the tipping point for us to say, 'We need to get this naloxone immediately available, without locking it up,' " she says. The easiest way to do it quickly, Bellino reasoned, would be to add the drug to automated external defibrillator cabinets already in place. Those metal boxes on the walls of VA cafeterias, gyms, warehouses, clinic waiting rooms and some rehab housing were installed to hold equipment for a fast response to heart attacks. Now the Veterans Administration, building on a project started in Boston, is moving to add naloxone kits to the AED cabinets in its buildings across the country, an initiative that could become a model for other health care organizations. "Think of this as you would a seat belt or an airbag," she says. "It by no means fixes the problem, but what it does is save a life." Giving naloxone to someone who hasn't overdosed isn't harmful, but it is a prescription drug. So Bellino says the VA had to persuade the accrediting agency The Joint Commission to approve guidelines for the AED naloxone project. The cabinets must be sealed and alarmed so staff can tell if they've been opened. They must be checked daily and refilled when the naloxone kits expire. The commission didn't agree to let the VA put the words "naloxone" or "Narcan" on the cabinets doors to alert the public that the drug is inside, but did allow the VA to affix the letter "N."
"The overwhelming evidence is that it just saves lives," says Dr. Ryan Vega with the VA's Center for Innovation. "We're hopeful that other health systems take notice and think about doing the same." Vets have nearly twice the risk of overdose, compared with civilians, says Amy Bohnert, an investigator with the VA Ann Arbor Healthcare System, citing 2005 death data. She says it isn't clear why veterans are more likely to OD, but many do have complex medical conditions. "Some of that's related to combat exposure," Bohnert says. "They've got mental health treatment needs. They may have injuries that result in them being more likely to be prescribed opioids than your average person. And all of these things can impact their risk of overdose." Some are stocking other lifesaving tools as well: tourniquets to stop bleeding after a shooting; EpiPens to keep airways open; and even injectors to treat diabetic shock. "This system is already in place," Cushman says. "The question is, how can we leverage it to save more lives?" Cushman says there are challenges to turning AED cabinets into miniature emergency medical stations. Medicines can't be left outside during extreme temperatures. They are expensive and expire. Those are all challenges, says Dr. Scott Weiner, president of the Massachusetts College of Emergency Physicians. He has encountered them all while developing street-level dispensing stations for naloxone. And then there's the belief among some that naloxone enables drug use by offering an assurance of life after an overdose. Weiner says that attitude is waning and as it does, the public may be more open to other controversial, lifesaving measures. "Naloxone is kind of the lowest barrier for people to understand, where someone has already overdosed and we're going to give them the antidote," Weiner says. "The leap to giving them needles [through a needle exchange] or allowing them to inject in a safe space, that's just another level of acceptance that people will have to get to." The Boston VA's Bellino hopes that AED manufacturers will start selling cabinets that meet the new hospital accreditation standards. So far, the Boston VA counts 132 lives saved through all three parts of its naloxone project: training high risk veterans, equipping police and the AED cabinets. The small cabinets on the wall in airports, schools, many government buildings hold heart defibrillators. Now the Veterans Administration is looking to add something else to those cabinets - nalaxone, also known as Narcan, the drug that can reverse an opioid overdose. It's all part of a project out of Boston, as WBUR Martha Bebinger reports. MARTHA BEBEINGER, BYLINE: It was at least 10 minutes from the time a housekeeper found a man on the bathroom floor in a Boston VA building to the time paramedics arrived with naloxone and brought the man back from an opioid overdose. Brain damage can begin after just five minutes without breathing. Pam Bellino is a patient safety manager for the Boston VA. She read the incident report back in December 2015 with alarm. PAM BELLINO: That was the tipping point for us to say, we need to get this naloxone immediately available without locking it up. And we're going to put it in our AED cabinets. And we're going to equip our police with naloxone. BEBEINGER: Equipping police with nasal spray naloxone is becoming more common across the country. But there's resistance to making the drug available in public. Bellino has heard from critics who say easy access to naloxone gives drug users a false sense of safety. BELLINO: Think of this as you would a seatbelt or an airbag. It by no means fixes the problem. But what it does is it's there to save a life. BEBEINGER: And it's a tool, Bellino says, that veterans desperately need. She cites a study from the Ann Arbor VA that shows veterans are at nearly twice the risk of civilians for an overdose. The lead author on that research, Amy Bohnert, says it isn't clear why, but many veterans do have complex medical conditions. AMY BOHNERT: Some of that's related to combat exposure. They've got mental health treatment needs. They may have injuries that result in them being more likely to be prescribed opiates than your average person, and all of these things can impact their risk of overdose. BEBEINGER: The idea of including naloxone and more in AED cabinets is spreading. The University of Rochester provides tourniquets to stop catastrophic bleeding and, in July, added naloxone. Dr. Jeremy Cushman says some schools and employers also pack Epipens into their AED cabinets. And there's talk of adding injectors to treat diabetic shock. JEREMY CUSHMAN: That system is already in place. The question is, how can we leverage that system to save more lives? BEBEINGER: There's another question - will the public know how to and feel comfortable using naloxone? Alan Kershaw, a Boston VA inpatient pharmacist, opens the door of an AED cabinet, which sets off a very loud emergency alert. ALAN KERSHAW: This is your Narcan kit. This is the instructions for use. BEBEINGER: Kershaw reads from a laminated instruction guide that starts with calling 911 and then looking for signs of an overdose - no breathing, no response to a sternum rub and lips or fingernails turning blue. BEBEINGER: ...Onto their side so that if the man or woman vomits, they won't choke. Start CPR. KERSHAW: If that person doesn't start breathing in two or three minutes, you roll them back on their back, get the second dose out of the package, insert that dose into the person's nostril, depress the drug plunger and then again roll them over for safety. BEBEINGER: Giving naloxone to someone who hasn't had an overdose is not harmful. The VA says it hopes placing the kits in its buildings nationwide will become a model for other health care organizations. For NPR News, I'm Martha Bebinger in Boston. SIMON: And this story is part of a reporting partnership with NPR, WBUR and Kaiser Health News. (SOUNDBITE OF JENOVA 7'S "YOU DIG?") Transcript provided by NPR, Copyright NPR.